Check it out: success! (see end of linked post) Our iris seeds are germinating. The photo below was taken this morning after breakfast. 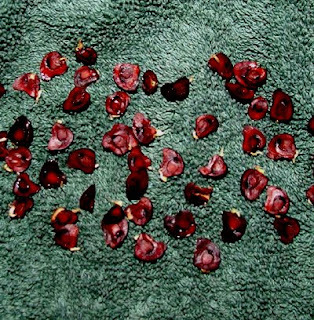 The seeds were emptied out of their temporary abode (plastic baggie) onto a towel to keep them from sliding off the table. We planted the iris seeds today. They’re a little bit behind their already-in-the-ground counterparts, so we’ll see what happens this year. The tulip shown below gets a gold star for being the first tulip to bloom in our garden. Unfortunately, it appears that we may have planted him too deep because he doesn’t have a stem! * This fall, we’ll be moving him up a little to see if that helps for the following spring. * UPDATE: We also read that short stems can occur when the bulb does not have a sufficient chilling period before planting. 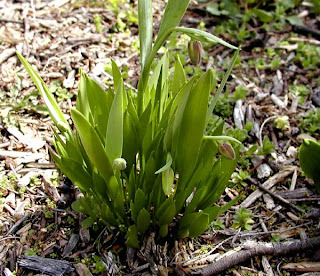 When the bulbs are being chilled, a growth hormone called gibberellic acid forms…hmmm…we did not refrigerate our bulbs before planting them in November. We’re used to chilly Ohio weather providing plenty of chill time when the bulbs arrive from the grower. Hopefully this tulip and his other short stemmed buddies will have longer stems next year. 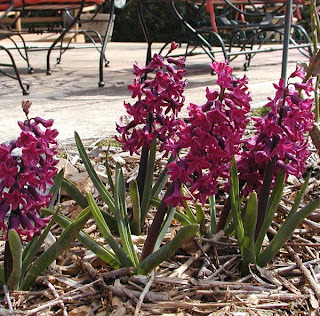 The hyacinths are blooming and smell great, like lilacs. Finally, we have no idea what this is…do you? 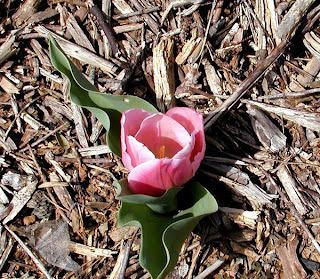 The bud has a tulip shape, but it’s facing downward and the leaves are unique. We have a bunch of clusters of these flowers. We’ll let you know what the blooms look like.